Not all night markets are created equal but all are delicious! We tried four Taipei night markets during our stay in August and will go back for more in December so keep an eye out for our updates! This is a very touristy night market. But don’t let that deter you! It’s great for shopping, playing arcade and carnival games and most importantly, eating! There are more clothes and accessories vendors here than at other markets, but still a plentiful selection of food. We went on a Saturday night so the crowds were huge! We recommend trying this market out on a weeknight, although it will still be crowded! One of the best Taipei night markets. Crunchy but chewy octopus sitting on a layer of doughy bread. A must try! Kind of like a big pork dumpling with a thicker dough. A lot thicker… Once you get to the meat it’s heavenly and the dough is slightly sweet. This was our favorite of the night. 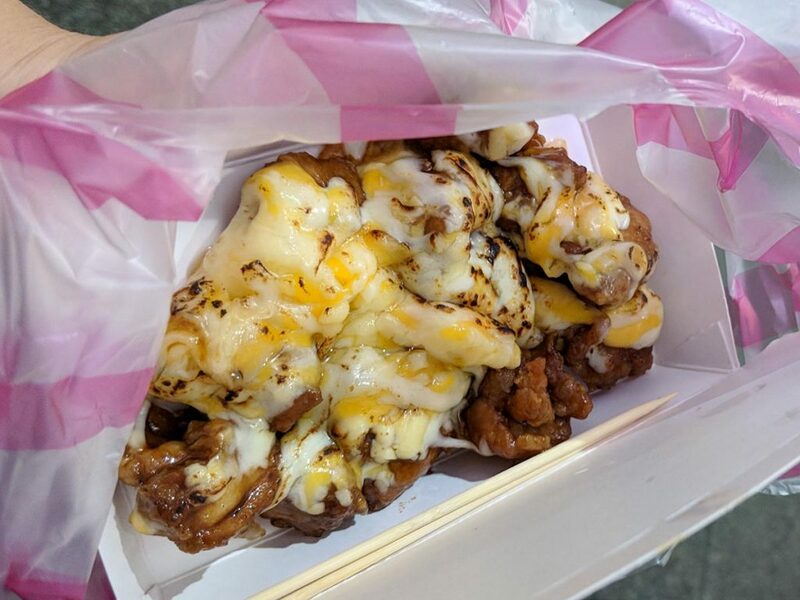 First, they fry the chicken, then they throw it in a pan with some sauce and then they put it in a box, throw on a layer of cheese and use a blowtorch to melt the cheese. The most refreshing drink of any night market we tried. Now we look for it every time we hit up a market! It was a Friday night with a light rain so that may have had something to do with the smaller crowd. There was plenty of room to walk and eat and a ton of restaurants here too. 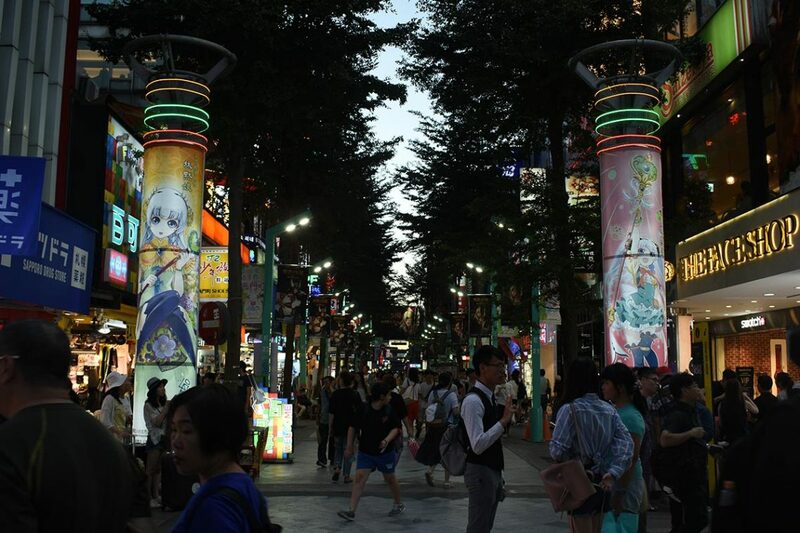 Similar to Shilin, this night market had plenty of clothing and shoe stores and random accessories, as well as arcades. 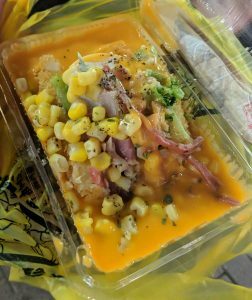 Shilin definitively had more options but the smaller crowd and more local scene made this one of our favorite Taipei night markets to visit. 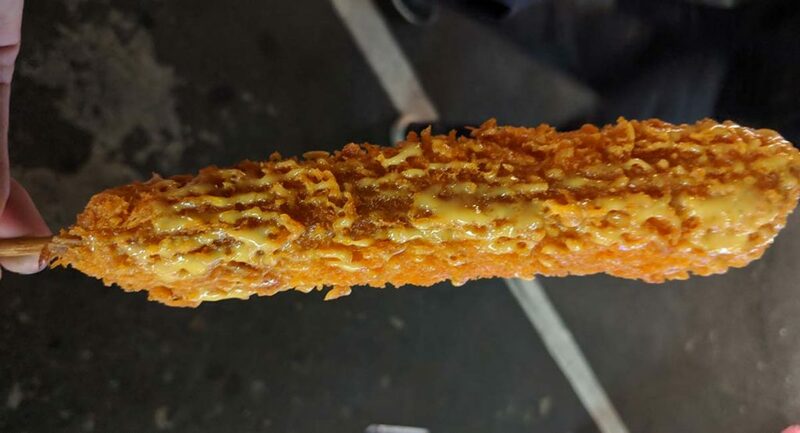 A long and heavy stick of fried shrimp and cheese. Need we say more? Try this! These hollow balls made of sweet potato have a little bit of sweet cheese on the inside. Ours weren’t overflowing with cheese like the picture on the stall, but they are a great dessert! We read about these online and had to try them! 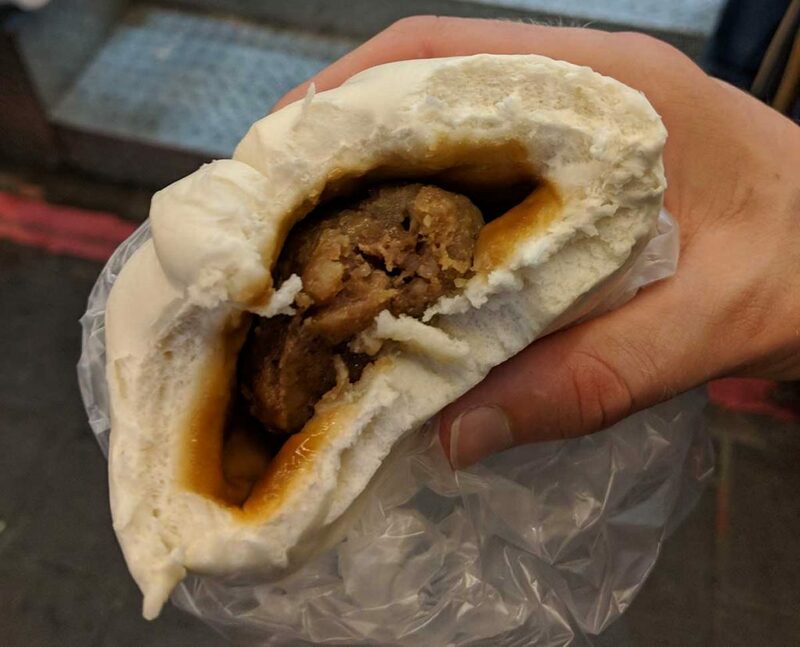 A pork sausage is placed inside a bun, which was a sausage made of rice. They give you a choice of delicious toppings; we tried pickled cabbage. Not as good as the lime orange from Shilin, but it did the job. These fresh fruit drink stalls are in every night market. Egg, green onion and a batter mixed together and fried on a skillet. 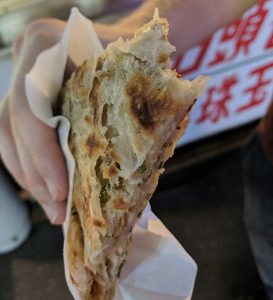 This can be found at any night market and is a must have! 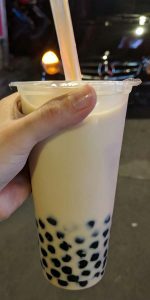 It wouldn’t be Taiwan without some bubble milk tea. Delicious as usual. 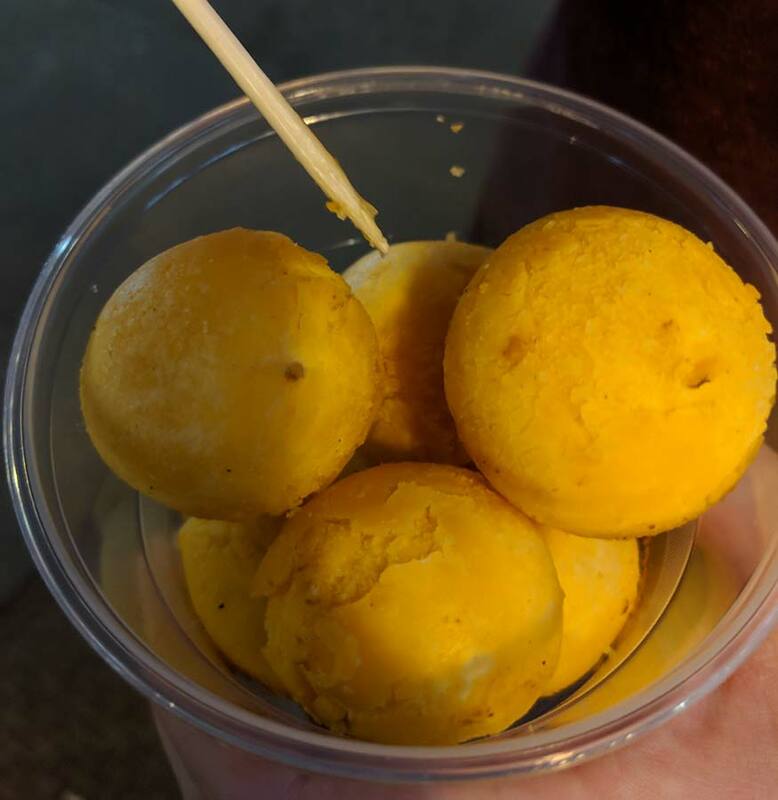 The tapioca balls at this particular vendor (located at the entrance of the night market) seemed extra big but we’re not complaining. From our quick research an hour before, we weren’t sure if this was a legit night market or not. We read a lot of reviews saying all kinds of things about this one, good and bad. Our curiosity won the day and we’re glad it did! Technically, the signs say “commercial district” but we’ll go ahead and call it a night market. It wasn’t lined with street food like others but there were plenty of delicious food options off the beaten path! Dine-in restaurants and shops were in command of this market, so make sure to visit if you’re wanting to sit down and relax for dinner or shop ‘till you drop. We also passed three cinemas so it’s a good area to catch a flick on the big screen. What we liked most about this night market was the open space. There were a ton of people but the streets were huge and made just for pedestrians. A few scooters came and went but were rarely an annoyance. Another plus is the plethora of trash and recycling bins. Holding on to that greasy trash from vendor to vendor can be a pain but not at Ximending. The market does lean more on the touristy side, but it’s one you should definitely check out. A great spot for people watching, including street performers and artists, and eating grub, of course! 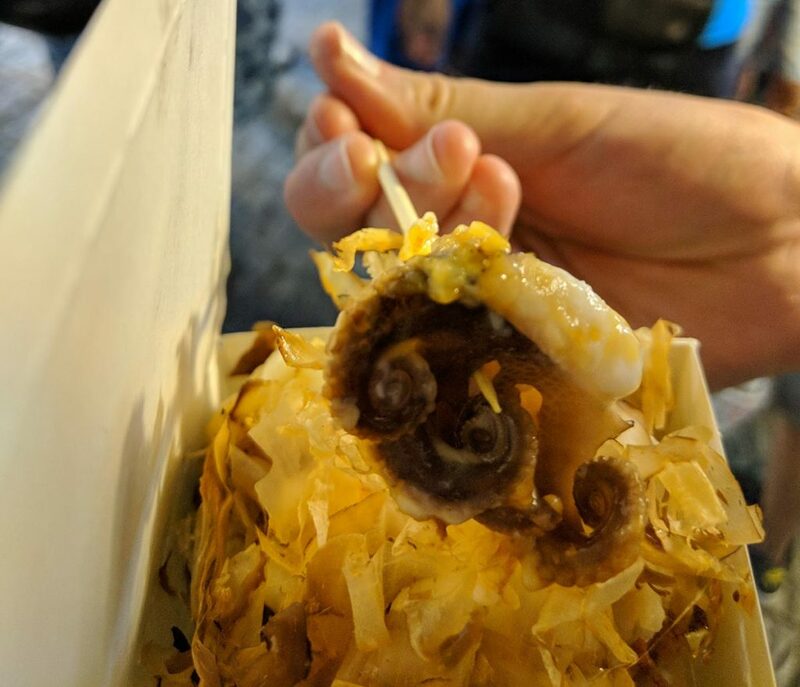 Does it deserve to be ranked among the other Taipei night markets? We don’t think the debate really matters, the food was amazing! 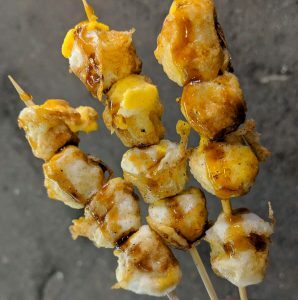 Small balls of egg on a stick with a dressing of soy sauce and salt. These were surprisingly tasty and only $1 USD! 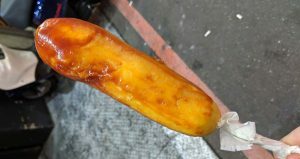 The same kind of corn dog you could eat at any state fair back in the states. We thought it might be special, but not really. It was smothered in ketchup courtesy of the vendor. 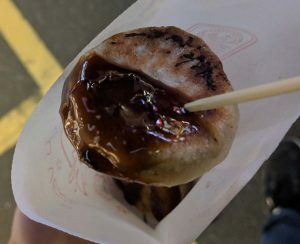 A bite-size pie that was more like a soup dumpling filled with onion and covered in sweet soy sauce. This. Was. AMAZING! A small fried potato, cut open and stuffed with pineapple, a hard boiled egg, broccoli, corn, a mystery sauce and 2 kinds of meat. SMOTHERED. IN. CHEESE. Our favorite of the night! Is Taco really in the name? We don’t know. The vendor didn’t speak English and his menu was in Chinese. But we do know it was an onion pancake in the shape of a taco, filled with bacon, egg, and a sweet soy sauce. Our other favorite of the night! One of the smaller Taipei night markets and frequented by locals, it was our first night market experience! And a smelly one! Stinky tofu, anyone? Darah told everyone before she left that she would try stinky tofu but once she smelled it she couldn’t bring herself to try it. The fact that the smell lingered in her hair the next day just made it worse. All that aside, this night market is great if you want less tourists. Food stands line the street and the border is formed by a string of arcade games along with several restaurants. This night market can definitely seem more crowded than Shilin (it’s not) because you and everyone else will be sandwiched between two lines of food vendors. Don’t bring your personal space bubble with you to this night market! Unfortunately, we don’t have any pictures of the food we tried. 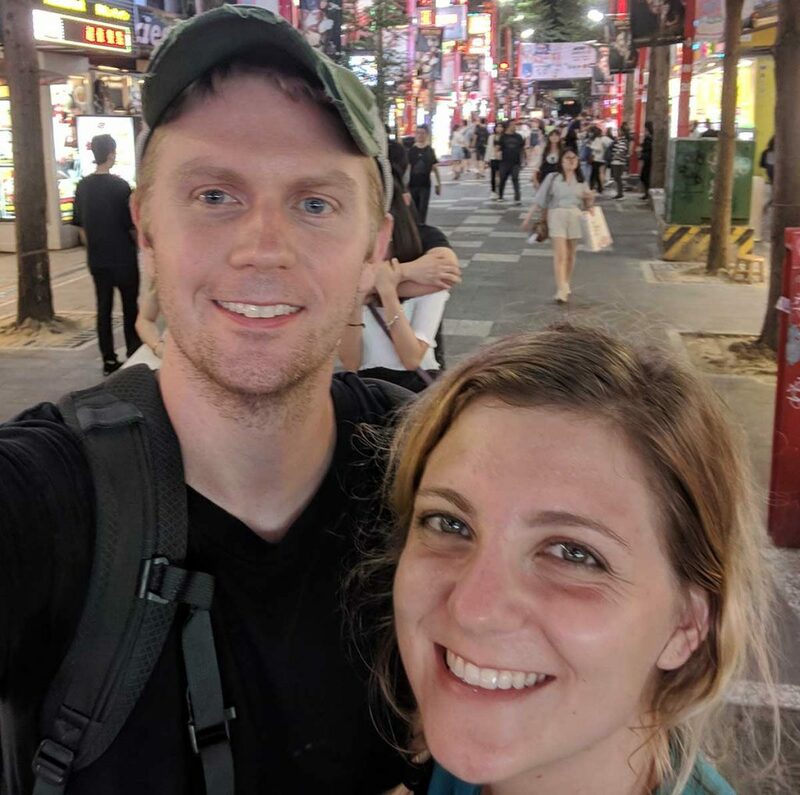 We might have been a little overwhelmed at the time… It was only our 2nd day in Taipei. That’s no excuse, we know. But take our “words” for it and check this night market out! A big greasy and crispy handful of fried chicken. It’s awesome. The vendor said, “Spice?” Trust us and skip the spice. It was a dry red powder that was hotter than hot peppers. We love hot, but whoa! Xiaolongbao, also known as a soup dumpling, is pork and gelatinous broth inside a thin dough wrapper and steamed in a bamboo basket. The gelatinous broth turns to liquids and then you enjoy. A small box of scrambled egg, shrimp, onion, and cabbage, and very very cheap! Like everything at this night market. Go! The best thing about all Taipei night markets is that they are so cheap! We spent between NT$300-500 at each market for two people. That’s only $9-$16 USD for a large variety of tasty food! A word to the wise for any night market, don’t just sit anywhere you please. We bought food at a stall and then found some chairs a ways down the street to get some eating room. However, that was another vendor’s seating area so they asked us to leave. Your best bet is off to the side away from the main street or at your vendor’s table if they have seating available. 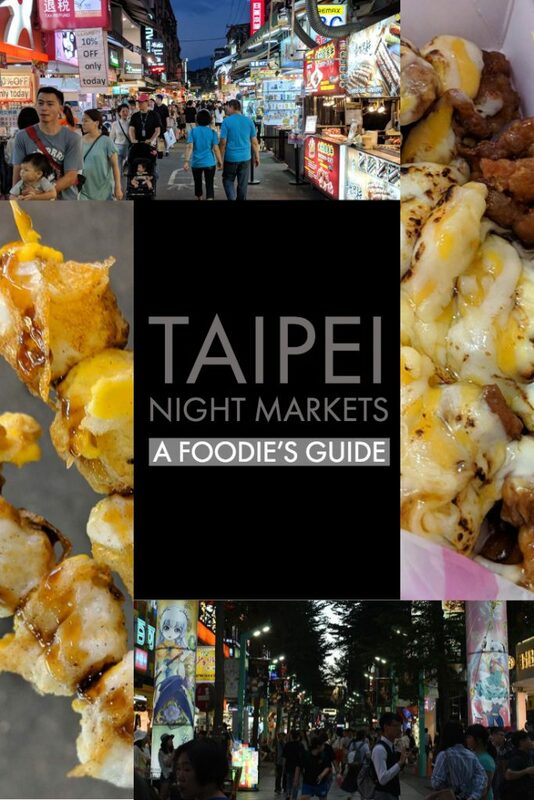 Let us know which Taipei night markets are your favorite below! For other great things to do in Taiwan, check out our posts here!